Nut allergies are extremely common, one of the top 5 most common food allergies. During my freshman year, my roommate had a nut allergy. We had dinner one day at the campus eatery. She ordered pesto pasta, but didn't mention to omit the pine nuts. Luckily, she didn't have a severe reaction, and when I made pesto, I couldn't help but think about that moment. Pesto is a great sauce. It can be used as a pasta sauce, as a spread on bread or in a sandwich, as well as a seasoning for baked chicken. Depending on the purpose, you can adjust the amount of salt and pepper. For something like pasta you may need more. For a sandwich spread you may need less. The same would go for the olive oil. 1. Remove the basil leaves from the stem. 2. Peel and roughly chop the garlic. 3. Slice lemon in half. 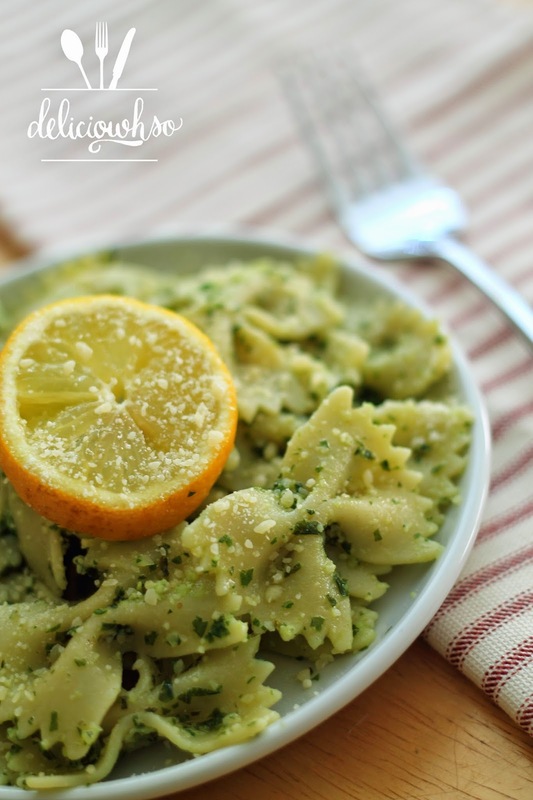 4. . Place basil, garlic, parmesean, lemon juice, salt, and pepper into a food processor. 5. Grind down to chop and slowly add the olive oil. 6. Stream the olive oil in until.the sauce reaches a pasty consistency. 7. Remove from food processor and use as desired. You can also add nuts if you would like. Traditionally pesto is made with pine nuts, but walnuts also work well. You can add a small handful of each to the recipe. Pesto also freezes very well! You can place into a small airtight plastic container or into an ice cube tray :) Just defrost to use. The pesto defrosts relatively quickly because of the oil. You can pull it out for a quick dinner option with pasta, veggies, and chicken!